Spent a while this afternoon searching for the memorial for Brandi Lee Galvin at Delaware 273 and Red Mill Rd. I was driving alone and the area was not familiar to me, so, not surprisingly, didn’t find the memorial. The wide open area, the complicated intersection, and the knowledge that someone had died there were all deterrents, I must admit. As you probably did as well, I looked up Brandi Lee Galvin when I got home and learned that she died on October 24, 2009. She was an 18 year old passenger in a car wearing a seat belt when she was killed. Two young children in car seats were injured. A fund for the Children of Brandi Lee Galvin had been established so I am assuming the children were hers. This was a senseless tragedy with no contributing factors listed in the newspaper articles. Whether or not I found the memorial, I was moved by her story and appreciate the opportunity to think yet again on this week of the Boston, West, Texas, and China earthquake tragedies how precious life is and how lives end tragically for no reason. On the Panoramio page we include links to a tributes.com post and a story by a local ABC affiliate. The invitations don’t include maps. 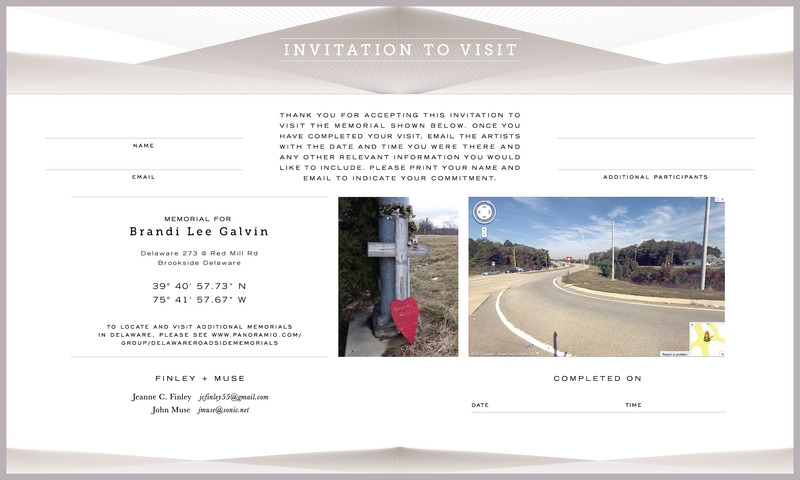 We include coordinates, approximate addresses, and Street View images. We hoped these would make palpable the process of comparing circumstances: as photographed by us, seen by visitors, and “seen” by Street View. But maps are helpful.